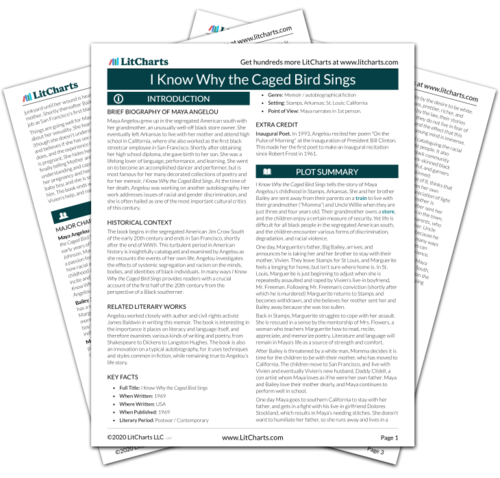 Instant downloads of all 942 LitChart PDFs (including I Know Why the Caged Bird Sings). 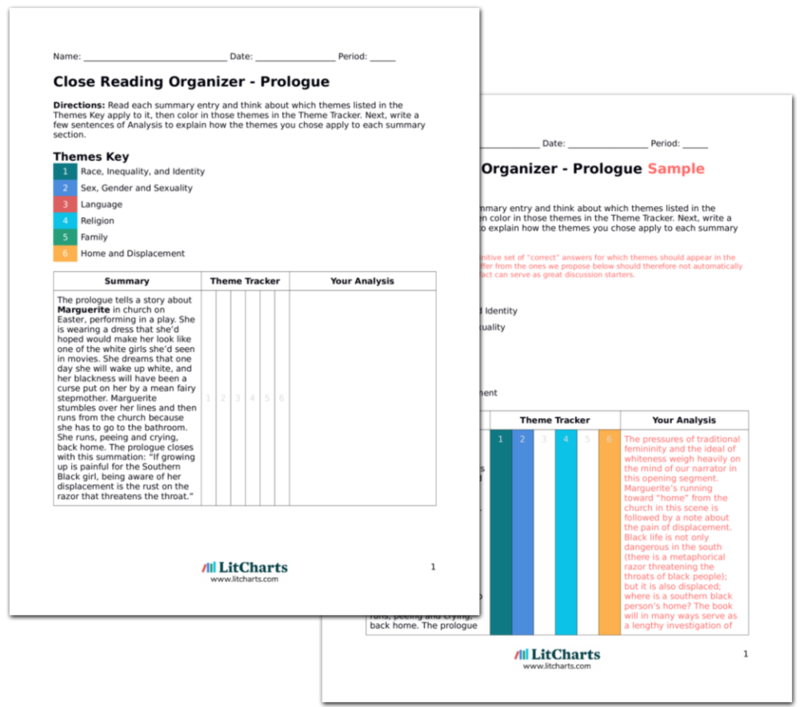 LitCharts assigns a color and icon to each theme in I Know Why the Caged Bird Sings, which you can use to track the themes throughout the work. Uncle Willie lives with Momma too—he is a bog man, who was crippled in an accident as a child. In the south, able bodied black men had a difficult time making a life for themselves; Willie is not only black, he is especially dark skinned and crippled, and is victimized by both blacks and whites. Marguerite can only remember one time where Willie, usually sensitive and honest, pretended not to be crippled. Strangers had stopped by the house, and Marguerite noticed Willie in the kitchen, standing behind the counter upright, though this position must have been very painful for him. The strangers asked Willie if he had children, and Marguerite reflects that she’d been willing to pretend to be Willie’s daughter. In that moment, when he’d tried so desperately to escape his burden even just for a few minutes, Marguerite felt closer to him than ever before. Uncle Willie represents the way prejudices can converge and complicate a person’s life and identity. It is a difficult life for a healthy, able bodied black man in the South. Willie’s other features (his dark skin, his handicap) make him a victim at the hands of able-bodied blacks as well as whites. The story about Willie pretending in front of the strangers is a touching articulation of the exhaustion of Willie’s burden. It also highlights Marguerite’s longing for family, and for a father figure. As a young black girl in the South, she identifies with the desire to live without burden, even for a moment, and this makes her feel connected to Willie. During these early years in Stamps, Marguerite “met and fell in love with William Shakespeare.” She feels as though Shakespeare understands her, even though he is white. She rationalizes that Shakespeare has been dead so long his race doesn’t matter; she does, however, have to hide her love of Shakespeare from Momma, who wouldn’t approve if she found out Maya’s literary hero was a white man. Maya’s love of language and poetry starts early—she is not even ten years old before she is reading Shakespeare. The way Maya rationalizes Shakespeare’s whiteness indicates how important it is to her (and to her family) to read and learn about black voices. They live in a white person’s world. Carey, Patrick. "I Know Why the Caged Bird Sings Chapter 2." LitCharts. LitCharts LLC, 5 Dec 2016. Web. 20 Apr 2019. Carey, Patrick. "I Know Why the Caged Bird Sings Chapter 2." LitCharts LLC, December 5, 2016. Retrieved April 20, 2019. https://www.litcharts.com/lit/i-know-why-the-caged-bird-sings/chapter-2.